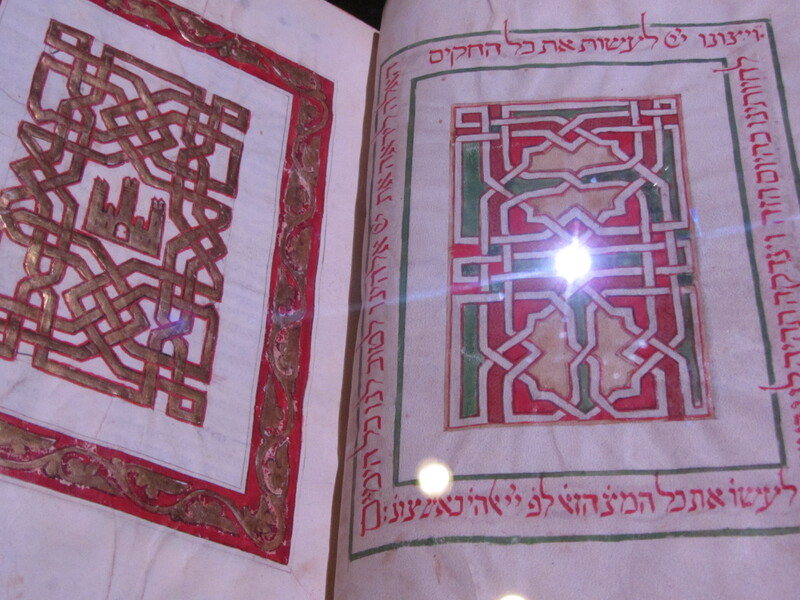 Go to the Jewish Museum to see Crossing Borders: Hebrew Manuscripts as a Meeting-place of Cultures. The works are on loan from the Bodleian Library at Oxford University. Its motley world is inhabited by dragons, unicorns, musicians, wild-men, and other animals. These frame manuscript and autograph editions of Rashi, Maimonides, and Nachmanides. The visual dimension underlined by the pages on display at the exhibit suggest the importance of space and place, and plastic design in medieval Jewish thought and culture. One of the points made in the catalogue-book has to do with the attempt to create seamless integrations between word-text and image. I like too the mention of the fact in the catalogue that these books were user-produced, not institutionally produced. It makes for an intimate effect and familiar affect. And yes, that’s Maimonides’ auto-graph. One more thing: it was a pleasant surprise to find out at the Museum that they allow you to take non-flash photography. I felt a little guilty taking pictures. It seemed to intrude on the dark quiet of the exhibition space and on the books themselves. I also thought it might be better to upload more professional reproductions. But I overcame my initial hesitation and got into the hang of it. I like the non-professional look, particularly in the imperfect shadowing and in the way the ceiling lights illuminating the display appear as a bright light-dots on the pictures. I’ve organized the slideshow so that the image comes first and then the description. This entry was posted in uncategorized and tagged aesthetics, animals, Jewish art, Jewish Philosophy, Museums & Galleries. Bookmark the permalink.